Bike 1.0, roughly 1950-1975, when the industry was dominated by a single brand, Schwinn, creating an era of relative stability at both the supplier and retailer levels. Bike 2.0, extending from the bike boom and introduction of the mountain bike through the late 1990s/early 2000s. The period was chaotic. Many new brands came and went, and the number of retail stores increased. Most importantly, the market was governed by the phenomenon of Perfect Competition, where no particular brand or brands can accrue enough share or competitive advantage to gain control of the market. Bike 3.0, starting near the turn of the millennium. The present era features a few dominant players in both the supplier and (per geographic area) retailer segments of the market. Bike 3.0 is characterized by a declining number of traditional retailers (as defined by the NBDA), contraction and consolidation of the supplier segment, and the rise of internet commerce, which impacts all segments. One aspect of the 3.0 era not discussed previously is not so much a defining characteristic as a driver for it: the decline in free-for-all innovation that powered the 2.0 era. By the turn of the millennium, the industry had largely figured out how to optimize mountain bike frames, suspension and component subsystems. Brands and consumers knew what worked, and increasingly, that’s what they demanded. But as mountain bike formats (including wheel size) stabilized, the bikes themselves necessarily became less differentiated. At the same time, consumers were moving away from the saturated mountain bike market, back to dropped-bar road bikes. But the 3.0 road bike format had been created some thirty years previous by European and then Asian and American builders. Beyond that, road bikes were a sophisticated product class with a century of overall development behind them, and less subject to large-scale change. For instance, road geometries in 2019 — including endurance and gravel — are largely the same as in the 1970s, perfected by European craftsmen in the Merckx era for various road conditions and applications. There are four significant exceptions to the general principle of slowed innovation as brands search for ways to create product differentiation. The first is incremental development of 2.0 technology, often borrowed from mountain bikes. This development includes the evolution of indexed shifting to electronic, introduction of more sophisticated wheel designs, an ever-increasing number of rear cogs (and the wider and therefore stiffer rear triangles that went with them), and a number of other enhanced stiffness technologies. But these were quickly adopted throughout the market and provided no sustainable advantage to their developers. The second, third and fourth exceptions to slowed innovation were all due largely to the rise of composite materials and, often in parallel, the creation of new standards (and increasingly, non-standards) for components. The entire relationship between bicycle frames and the equipment that went on them changed significantly, and in a very short time. Molded composite frames were pioneered in the late 1980s by brands like Kestrel and Trek. Small production volume kept them from having a major impact on either the market at large or on component design specifically. But as composite frame numbers (and pricing) expanded, they facilitated a move away from traditional tube dimensions and shapes, and equipment evolved to take advantage of these new designs. The same changes were then adapted back to metal frames, especially aluminum, and helped refresh that product class as well. As a result, the industry could now command an elevated price ceiling, while simultaneously creating an expanded class of performance-based enthusiast riders willing to pay those prices. Finally, as the evolution of frames and equipment continued and the market for them evolved linearly, the R&D time and expense necessary to extend performance evolution increased exponentially. The days of back-of-the-napkin product design were over. At the same time, the number of players with resources to meet the new R&D requirements shrank, further empowering the largest and strongest brands. But even that evolution has become increasingly incremental. In the 2.0 era, the dominant supplier strategy was to increase market reach by simply opening more retailers in an area. OE equipment followed the bike brands it was (literally) attached to, and aftermarket equipment followed the OE market. On the retailer end of the business, the key strategy was to control as many bike brands as possible to minimize differentiation by competing shops. 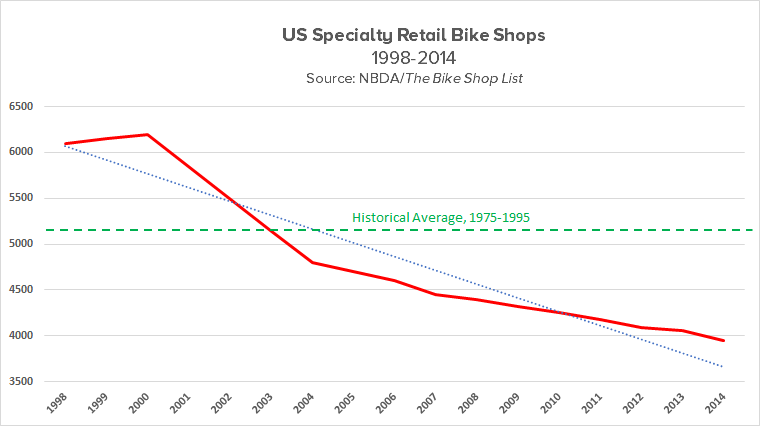 But with the mountain bike bust in the late 1990s, the oversaturated retail market crashed. At the same time, the rise of discount internet sellers gutted retailers’ most profitable revenue stream, aftermarket equipment sales (parts accessories, rubber and apparel). Suppliers were forced to look for new strategies. Almost by definition, the surviving retailers were smarter, better-financed and possessed of more business savvy than those left behind. Bike brands shifted focus from the most retailers per market to deeper relations with the most successful ones. And of course the most successful retailers wanted to be allied with the most successful bike brands. Nowadays the name of the game is not just the number of retailers (although it certainly helps), but controlling the most floor space at the best shops, effectively locking competing brands out of premium retailers’ stores and forcing them to marginal ones. The reverse is also true: less successful retailers are less likely to have access to the more successful bike brands. Even if large brands could not meaningfully differentiate their products, they could still control the sales channel that delivers those products to consumers. And that’s the sustainable market advantage that empowers the 3.0 dynamic. A secondary result is that equipment from leading bike brands is (generally) not available at discount on the internet or to competing dealers. This translates to much higher equipment profits for both brands and their allied retailers. Of course, massive discounts for competing equipment brands impacts these leading brands’ sales, too. Even so, online discounting punishes unallied retailers disproportionately. The net result is straight out of Business 101. As a few brands — whether supplier or retailer — rise to the top, the middle of the market collapses and remaining players are forced either to the margins or out of business entirely. These less successful players are increasingly forced to differentiate by price/value relative to the leaders, and that lower pricing results in lower profits … which further disempowers the marginalized players and perpetuates the 3.0 dynamic. Currently there are two huge changes in the industry landscape with the potential to disrupt the 3.0 era and perhaps unseat its dominant players. E-bike growth is robust and (largely) incremental; that is, it generally does not cannibalize sales from existing product categories, at least not in the US. That means more riders in the overall customer base, a significant injection of sales dollars into the channel, and new sales opportunities for players all across the supply chain. E-bikes are more resistant to competition by internet discounters and mass market retailers. The price tag on quality models is well outside the reach of Walmart and its ilk. At the same time, high freight rates for larger and heavier e-bikes makes them more difficult for online retailers to discount. Post-sale, service requirements are significantly more complex (and therefore profitable), throwing a greater share of both sales and service business to brick and mortar retailers. New players in the market. The dominant brands in pedal-only bikes are far less dominant in the e-bike segment, and likely to stay that way for the foreseeable future. This is true in every market worldwide. Agile new brands and retailers continue to enter markets, reducing big-player share even further. This means top-tier brands enjoy less control of limited floor space at their dealers, and conversely drives more business to new and/or nonaligned retailers whose floor space is more easily allocated to competing e-bike brands. Finally, the current dozen or more e-bike competitors from the automobile and electronics industries have the potential to decimate both supplier and retailer markets ... if they can create workable distribution channels, which so far they have not. Absent old-school auto or electronic brands like Peugeot or Panasonic, viability of these manufacturers in the two-wheeled world has yet to be proven, even in concept. But remember, these behemoths are literally hundreds of times larger than even the biggest bike companies, with resources to match. It’s early days yet. The second potential disrupter is bikeshare services, which often come courtesy of huge companies like Uber. These companies’ business model is not to sell bikes, or even run their bike services profitably, but to use electric bikes as a minor but integral component in a strategy to monopolize motorized vehicle fleets on urban streets. The impact of bikeshare on the specialty retail cycling industry is unknown — and perhaps even unknowable — at this point. As noted in Part One, none of this is either good or bad. It is simply reality. Barring major market shifts, it’s also the way things are likely to stay. And as always, we ignore this reality at our peril. Note: Industry members and alumni interested in these and other relevant topics are invited to join the Facebook discussion group Cycling Industry Recovery (that’s “recovery” as in 12-step, not as in “trying to save the world”). Again, membership is restricted to cycling industry pros and alums.